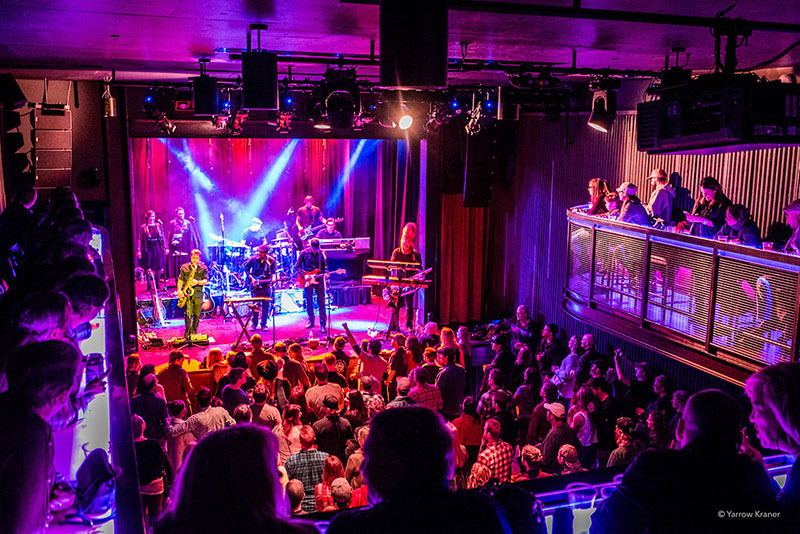 The upgrading and facility enhancement of theater and performing arts spaces continue on an upward spiral, whether in converted environments, new construction and refurbishment of existing venues. With that in mind, we present these recent installation projects. Each takes a different approach, proving there are numerous solutions to any audio challenge — large or small — for any performing space, either new or historic. With just over 1,500 seats, the Joan Sutherland Theatre (JST) is the second largest venue in the Sydney Opera House complex. Home to year-round performances from the resident companies Opera Australia and The Australian Ballet, the theater also stages musicals, talks, comedy and contemporary music. The JST venue recently completed the first phase of a $71 million renewal project (during a May through December 2017 closure), with additional tweaks wrapping up in mid-2018. Projects included upgraded lighting, a new flying system and grid deck, improved orchestra pit, a state-of-the-art acoustic enhancement system for orchestral players and a new audio console in time for the JST’s New Year’s Eve 2017 reopening gala. 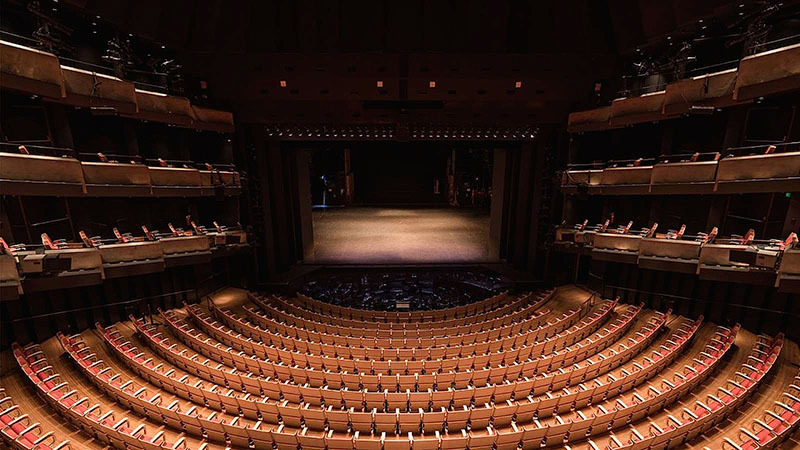 Suppliers Professional Audio & Television delivered, configured and commissioned a Lawo Nova73 router/DSP core and a Lawo Crystal console including compact engine for the Joan Sutherland Theatre via lead integrator The Downer Group. The Lawo Nova73 Core was configured as an mc² Mix Engine. Used as the Central Audio Router for the theater, the Nova73 combines MADI, Ravenna and Dante signals, along with traditional analog and AES by way of a Lawo Dallis I/O Frame. Lawo’s mxGUI is used as the primary control interface for the router, letting users load snapshots for different room configurations while also offering user manual adjustments of signal flows and parameters. 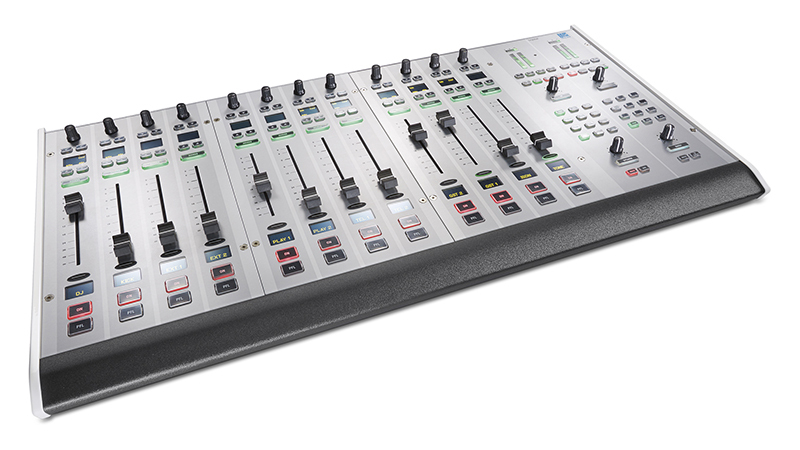 The system is completed with a VistoolMK2-equipped Lawo Crystal console, to provide a simplified tactile (or customizable on-screen) mixing surface. This allows for basic use of the JST for situations such as rehearsals or simple presentations. “The Lawo Nova core has been solid since its install in January and has already seen significant use. We are very satisfied with the Lawo technology,” says the opera house’s renewal technology manager David Dalton. The Portland Art Museum celebrated its centennial in 1992, expanding its campus with the purchase of an adjacent 1925 Masonic temple, now known as the Mark Building. Today, the renovated addition houses museum offices, a massive library, gallery space, two ballrooms and a theater. The largest venue within the complex is the 1,000-capacity Kridel Grand Ballroom. After evaluating several similar systems, Woods and Muhr concurred on the choice of LINA. 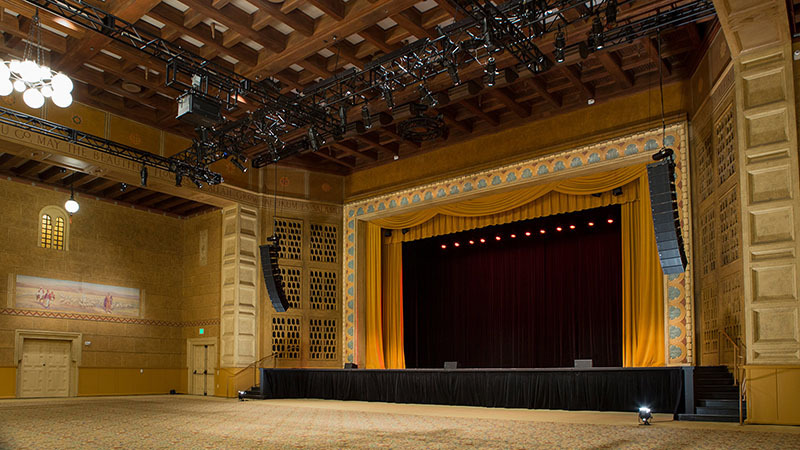 Designed and supplied by Eugene, OR-based George Relles Sound, the system incorporates 12 LINA speakers per side with bass bolstered by a pair of 1100-LFC low frequency control units. 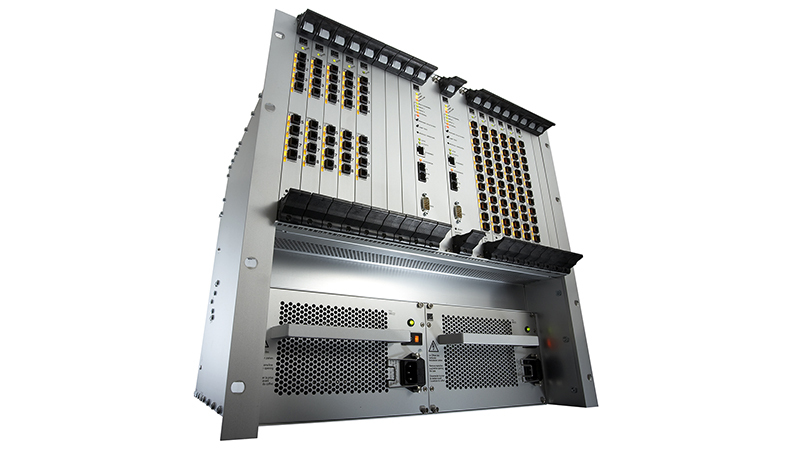 Three Meyer UPJunior speakers provide front fill, and a Galileo Galaxy network platform supplies processing and drive. “Everybody from nationally known artists to local production companies who has mixed on the system has been happy with it,” says Muhr. On the front-end, the Kridel Ballroom employs a Midas M32 console along with Earthworks podium mics, DPA lavaliers and Countryman E6 headset mics. The Shure ULX-D digital wireless system includes bodypacks as well as handhelds equipped with Beta 87 and Beta 58 capsules. Once upon a time, movie theaters were truly palaces, and few could equal Loew’s five lavish “Wonder Theatres” built in and near New York City between 1929 and 1930. 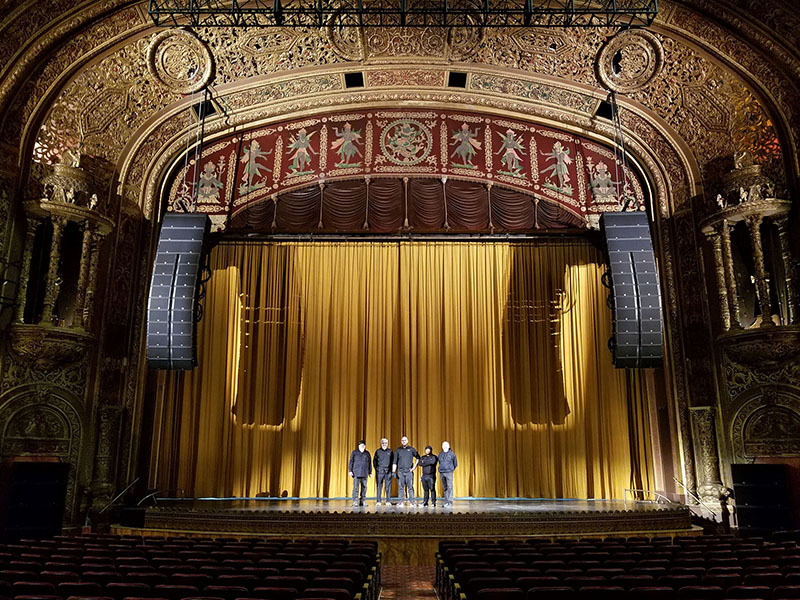 Efforts are underway to restore several of these octogenarians, yet Loew’s 175th Street Theatre — today known as United Palace — has remained in almost constant use since day one and now has a new L-Acoustics sound system. Located at West 175th Street and Broadway in upper Manhattan, the facility stays busy hosting church services, theatrical productions and music concerts. Boston’s Audio Spectrum, Inc. installed the system in the theater, comprised of 20 L-Acoustics K2 array elements and six K1-SB subs divided into two flown arrays, eight SB28 ground subs, four X8 coaxials used as front-row fills and a dozen LA8 amplified controllers to power them all. As the former technical director for Caesar’s Entertainment in Las Vegas, DeFilippis first encountered L-Acoustics when he heard the V-DOSC system used in the Paris Theatre for Barry Manilow, ultimately transitioning it over to the Rio Theatre for Penn & Teller. “That system was powerful, durable and sounded great,” he says. As it turned out, Audio Spectrum — one of the companies that brought rental systems into United Palace — is an L-Acoustics vendor. “Rafael Jaimes at Audio Spectrum knows the Palace well and felt K2 would be the perfect system for this room, and it is,” notes DeFilippis. “The perception of the Palace is changing, being increasingly regarded as a great concert venue, and by bringing in a rider-friendly P.A. like K2, we’re helping promote that perception.” Indeed, the neighborhood, once regarded as rough-and-tumble, has been gentrifying, paving the way for a renaissance with the Palace as a gem in its crown. But the K2 system solved another issue for the venue. Its massive balcony, divided into an upper and lower loge and a main balcony, hovers over a huge swath of the orchestra-level seating in the 3,352-seat theater. The rear sections of both levels were difficult for sound to reach. K2, along with L-Acoustics’ PanFlex system — a horizontal-steering technology that combines mechanically adjustable fins with DSP algorithms effective from 300 Hz — quickly resolved that issue. Narrowing or widening the horizontal directivity of the adjustable fins can serve many purposes, including, in this case, adapting the throw to fit long and short distance coverage/SPL requirements, while also avoiding reflective surfaces. The historic 400-capacity (SRO) Rialto Theatre in Bozeman, MT has been totally remodeled to include a new Nexo GEO M10 line array system. Charles Salter Associates designed the building acoustics with sound system installation by Jeremiah Slovarp, the technical director at Bozeman’s Jereco Studios. “The theater is mechanically floated/acoustically decoupled from the outside world and the inside of the building,” says Slovarp. “The Burn Bar and Light Box conference center are also mechanically floated/acoustically decoupled from the theater below.” The Burn Bar is a hip bar overlooking Main Street and the Light Box is a conference center used for meetings and events. The theater can also swing from SRO to tables and chairs for theatricals, seated concerts, corporate presentations and movie screenings. The Nexo system includes a six-per-side GEO M10 line array system rigged with GMT-LBUMPM10 flyware. The setup also includes four Nexo LS18s, four Nexo ID24 speakers for front lip/center fill, eight ID24 speakers four per side surround left and right, and two NX 4×4 amplifiers. The Burn Bar and Light Box conference center above the theater feature four ID24 speakers, two (black boxes) in the Burn Bar and two (white boxes) in the Light Box. 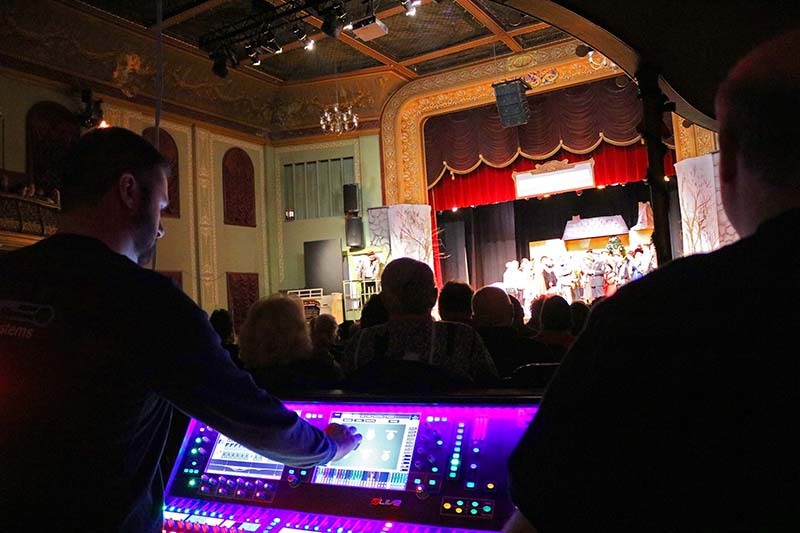 As part of a major audio upgrade, the historic Thomaston Opera House in Thomaston, CT, recently added an Allen & Heath dLive S Class digital mixing system with an S5000 Surface, DM48 MixRack and DX32 Expander. The Opera House is home to the Landmark Community Theatre, which performed Spamalot, Hairspray, Grease, The Diary Of Anne Frank, Mamma Mia! and It’s A Wonderful Life during its 2017 season. National Theatre/Lyttelton Theatre, London, U.K.
Riedel’s MediorNet, Artist and Bolero communications systems are playing major behind-the-scenes technical roles at the National Theatre in London. 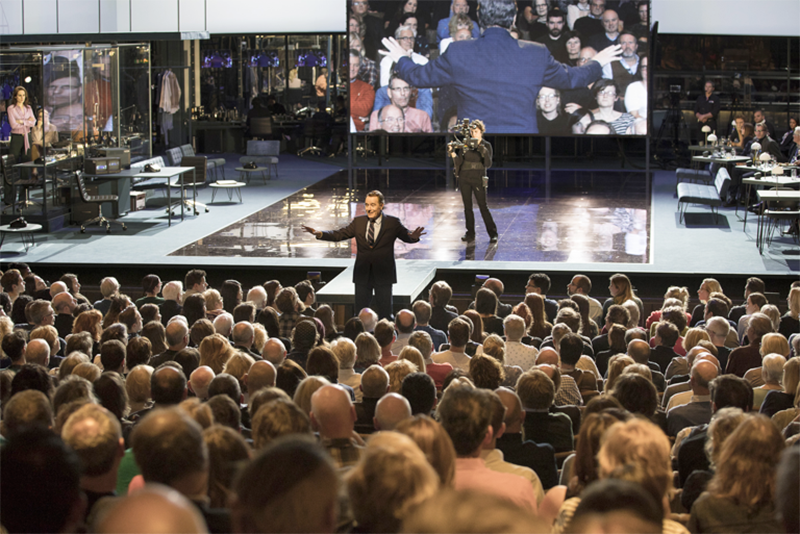 Recently, the company announced the theater is using the same Riedel products as functioning stage props in its highly anticipated stage adaptation of the 1976 television news satire, Network, in its Lyttelton Theatre, one of three venues within the complex. Network is the story of Howard Beale, an out-of-control news anchor played by Bryan Cranston (of Breaking Bad and Malcolm in the Middle fame). The movie was widely regarded as ahead of its time in 1976, when it won four Academy Awards. 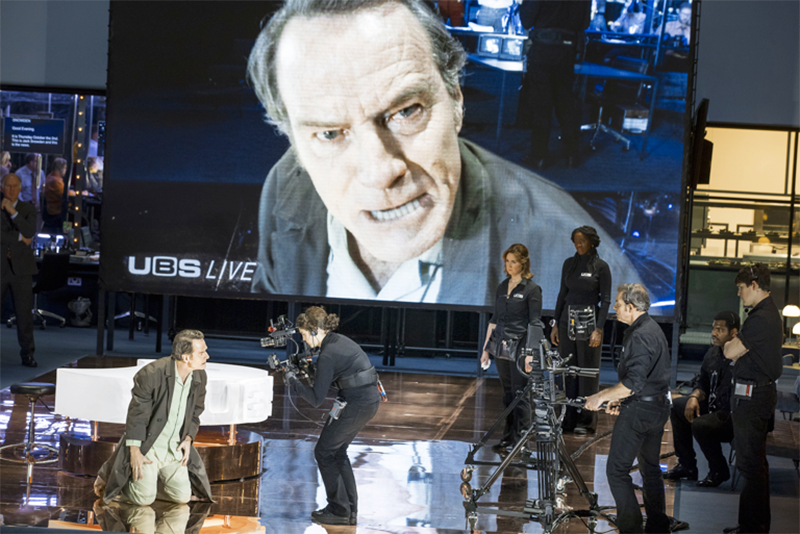 The stage adaptation at the National Theatre, directed by Ivo van Hove, is true to its roots and remains surprisingly relevant even 40 years after the movie’s premiere. Riedel’s Bolero wireless and C3 wired beltpacks are clearly visible in nearly every scene of Network, worn by onstage camera operators and stage managers. MediorNet MicroN and MicroN MultiViewer units were rented specifically for the production and were used to provide video feeds for screens that were key components in the production.